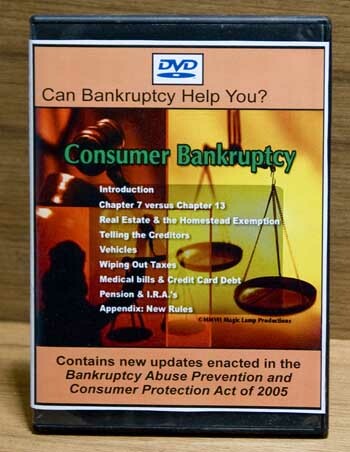 BANKRUPTCY DVD: Can it Help You? Use UPS' home page to trace your DVD/s all the way to your front door! Bankruptcy is not a dirty word... it is a federally approved way in which honest people who are overloaded with debt may get out from under that debt and get a fresh new start by wiping out ("discharging") most, if not all of their debts and with proper counsel, still retaining many of their belongings. In a chapter 7 ("straight") bankruptcy, the court liquidates all of your non-exempt assets to pay the creditors. The only items you are allowed to keep are those that have been classified as "exempt." The experienced professional's job is to see to it that you keep as many assets as possible so that the classification process becomes very important to you. In a chapter 13 bankruptcy, the court lumps all of your outstanding debts into one sum and arranges for you to make monthly payments through the court. Each payment is then broken down and distributed to the creditors until a portion of the entire debt is paid. During the time that payments are being made, the creditors cannot proceed against you and all of their collection efforts, suits, interest and penalties come to a halt. In order to qualify for filing a chapter 13, you must show that you have some steady source of income from which to make payments, insuring that the plan will work. Once you file a chapter 13, if you then lose your source of income, you may convert to a chapter 7. No matter which type of bankruptcy you file, the court will not allow you to keep items purchased in contemplation of filing bankruptcy, so don't even think about a pre-filing spending spree!. The court will also set aside (no allow) what it considers to be fraudulent transfers of assets, like selling your new paid-for car to your brother-in-law for only $10, just before filing bankruptcy (probably with a side agreement for you to re-purchase it back for $15 later on). Remember: the federal bankruptcy laws are designed for honest people who are so burdened with debts that they find it impossible to pay those debts and still maintain a reasonable life style... it is NOT designed for thos who just don't feel like paying off their credit card bills. If the bankruptcy court feels that you have enough income to pay your debts, they will deny your bankruptcy petition. It is extremely important to tell your lawyer the truth, so that he can help you avoid any unintentional fraud against the court. And when you do go to someone to help you file for bankruptcy, bring a complete list of all of your bills! Anything you leave out may not get discharged and you may still be responsible to pay it. In most jurisdictions, bankruptcy professionals advertise in the local newspapers. Call them and you will probably find one that will give you a FREE initial consultation. Watch our DVD on bankruptcy completely at least once, so that when you see the person who will be assisting you with your filing, he or she will not have to waste too much time trying to explain to you what bankruptcy is. Remember, the professional's time always winds up costing you money. Our DVD on Bankruptcy (item #101) is a full 100 minutes long and features several expert bankruptcy attorneys who discuss all the most frequently asked questions about filing bankruptcy: how it affects your job, house, car, pension, savings, "stuff," tax liens, fines, judgments and much much more. You can order it for only $39.95 and use it to help you make what may be the most important financial decision of your life! ORDER your Bankruptcy DVD today. Information on how to prepare to have your deposition taken in a civil case.